Several folks have reached out to me wondering my opinion about the Cheerios ad heard ’round the world in the last week or so. The ad, posted on YouTube, featured an adorable little girl, her mom, and her unsuspecting dad sleeping on the couch. Now, you might be wondering what about this could possibly cause an uproar. Well, the ad sparked the attention of all the racist, anti-black folks out there who have nothing better to do with their lives than belittle others. You see, the cute little girl in the clip was biracial. Her mother was white and her father was black. So, other than that, it was a very cute, normal commercial. 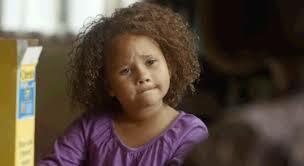 Now, let’s begin with the most obvious and noticeable feature of the commercial: that little inquisitive girl, with her bouncy curls and furrowed eyebrows, is absolutely adorable. I mean, she is friggin cute. I think she might be made of cotton candy, sugar plums and SweetHearts (my all time favorite candy). And, since you are visiting this site, I can assume that you, like me, noticed that first and foremost. But, if you were a bottom-feeding, ignorant, simpleton racist, you might have gotten distracted by the different colors of the family. You know, the mom is kind of peach. The sugar plum baby is kind of corn tortilla colored while the dad is the nice bold color of a cup of coffee. I mean, how does that work? Do people of those colors actually make up a family? Can they love each-other given the fact that they all look…well..different. If I were an idiot, I would find that kind of weird too. Moving on, I am not going to glorify the responses to the commercial which caused General Mills, producer of Cheerios, to shut down the comments section on the video. What I will say is that they were extremely outnumbered by level-headed, educated folks who know better than to look at life as a blown-up crayon box. But, they were disturbing nonetheless. One particular critique of this whole debacle that made me pause was a response from Eric Liu over at Time. He made several assertions that I find a bit speculative. And, as a member of the black community, I think his diagnoses might be a little misdirected. Plainly, Mr. Liu is an Asian-American. And, the daughter whom he lovingly describes throughout his post is multi-racial, none of those races being black. Since the interracial couple and child in the ad were white and black, I think this might be an “eye of the beholder” critique. Nonetheless, I shall commence. First, he said this about post-racialism. Tsk Tsk Tsk Mr. Liu. I say tsk tsk tsk. While I agree that angry whites suffering from feelings of powerlessness might lash out in a fit of rage before walking quietly into the night of racial equality, coexistence, and general acceptance of other folks’ differences, do you really believe that the swaths of YouTube users who felt the need to virtual “parking-lot-pimp” on Cheerios represent the REAL racists who help to perpetuate and fortify racial tensions? Could it be that these were the already powerless whites who’s diminutive power structure and lack of economic standing due to class status yields aggression towards blacks? I am not saying we can’t get there. But, I am saying that we are a long ways off. And, like any journey, the hope of becoming post-racial will require a lot more than a biracial president who identifies as black and a YouTube commercial. Second, Liu said this of the media’s reaction to the hatred and vitriol. Really Mr. Liu? Like, really? Please name a time in the last half-century when the media didn’t stand on the more liberal side of the race discussion. What progress does this represent exactly? What you might actually be noting is how this seemingly obscure commercial rose to prominence as a result of media coverage. But, the progress there is not a sociological one but a technological one. We had no YouTube 15 years ago. And, social media and networking was not a readily accessible outlet for racists, non-racists, and white news editors to coalesce on a topic as common as this one. Folks have disapproved of this stuff for some time now. We just didn’t know it. Is that progress? Well, I guess if you mean in the “I used to buy paper newspapers now I just read them on my Kindle” kind of way. Lastly, he said this of the complexity of race (a point that I actually somewhat agree with). Okay, Mr. Liu. You got me on this one. I agree that race has gotten too complex for racists. That is likely because racists are “stoopid.” And, folks of mixed race heritage do appear to be identifying themselves as such at much higher rates now. One question though, does that mean that there are more mixed race Americans now or is it becoming more common (due to social networking and other ways of finding people like yourself) that these individuals feel comfortable identifying as such? In the black community, we have only recently shaken off the ignorance known as the “one-drop rule” segregating brownies and big butts from “red bones” with curlier hair. But, does that mean that there are more interracial folks now? I am not so sure. Let me explain, in clear terms, where the progress is here. It isn’t found in the fact that General Mills made the Cheerios ad. Business is business, and they need their market share regardless of the demographic of their audience. The progress is not found in the media’s reaction or the outnumbering of the racists. The real progress here, sir, is in the people that no one has mentioned once in this entire debate. It is in every single person who viewed that ad and said, “awww, how cute.” All those people who merely went about their day, not jaded, offended, or even the slightest bit affected by the ad. Those are the signs of progress. Over 1.8 million people viewed that ad, and 85% of them said nothing. They didn’t click like or dislike, they didn’t comment, and they, hopefully, didn’t cause a fuss over someone else’s complexion. Let’s rest and reflect on that bit of progress. Though elusive at first, it might be more representative of the post-racial sentiment you are trying to capture Mr. Liu. As for the rest of us, who cares? It’s just a commercial…right?